Most likely you have heard of the latest fabricated horror story to surface against the democratically elected President of Syria, Dr. Bashar Al-Assad. This latest emotional ploy intended to undermine Syrian peace negotiations and validate US intervention was announced on the eve of the Geneva VI talks. The State Department said Monday that it believes about 50 detainees are being hung each day at the Saydnaya military prison, a 45-minute drive north of Damascus. They allege that political prisoners were tortured and murdered in Sednaya prison and their bodies were burned in a crematorium to cover up the mass killings. The Syrian government state dismissed these allegations and described them as “lies” and “fabrications,” noting what it called a U.S. track record of using false claims as a pretext for military aggression. The Foreign Ministry said the allegations are a “new Hollywood plot” to justify U.S. intervention in Syria. The published pieces quote Stuart E. Jones, the active Assistant Secretary of State for Near Eastern affairs, and include two satellite images, which they allege were taken in January 2015, of the Sednaya prison near Damascus. In other words, all Amnesty’s findings were in fact fabricated. These fabricated images almost appear to have been created for the video game industry by some overgrown teenager living in the basement of his mother’s house. War propaganda used to demonize the Syrian president and government. The American ambassador to the UN, Nikki Haley, came up to comment on the situation immediately. As if on command, she accused the Syrian government of crimes against humanity while placing some responsibility on Syria’s allies. Her scripted actions and words are not subtle in the slightest and are quite efficiently used by western states to torpedo or complicate a process of peaceful settlement. Yet another ‘sensational’ and ‘unclassified’ disclosure by the U.S. of alleged mass executions in Syria and bodies burned in a crematorium are dubious and aimed at undermining the settlement process. It isn’t an accident that such accusations are published on the eve of the Geneva VI negotiations. Just when the talks in Astana which excluded the U.S. seem to become fruitful Washington launches yet another slander campaign and attempts to exploit the media to turn the world’s attention to ‘Assad’s regime’. President Bashar Al-Assad’s opponents are desperately looking for any possible way to undermine the Syrian government and sabotage the peace process. Such U.S. actions are quite an obstacle on the way to peace in Syria. The conflict parties have shown that they are ready to find a solution to the crisis and to put an end to the terrible war. The positive results of the Astana talks gave impetus to Geneva-6. However, instead of backing the process, the U.S. decided to once again fabricate horror-moviesque baseless allegations against the legitimate Syrian government. It is highly concerning when Donald Trump’s State Department has seemingly reached a point of desperation in its failure to achieve its violent Syria agenda. It is wise to see as an ominous warning the Trump administration’s attempt to push forward such clear war propaganda. Absolutely, reviving and adding more layers of speculation to the discredited Amensty International allegations also shows very little creativity. Rather than create an entirely new horror story they are attempting to revive the aforementioned debunked, meritless one and give it new life. Their attempts at this revival will be just as futile as the last. 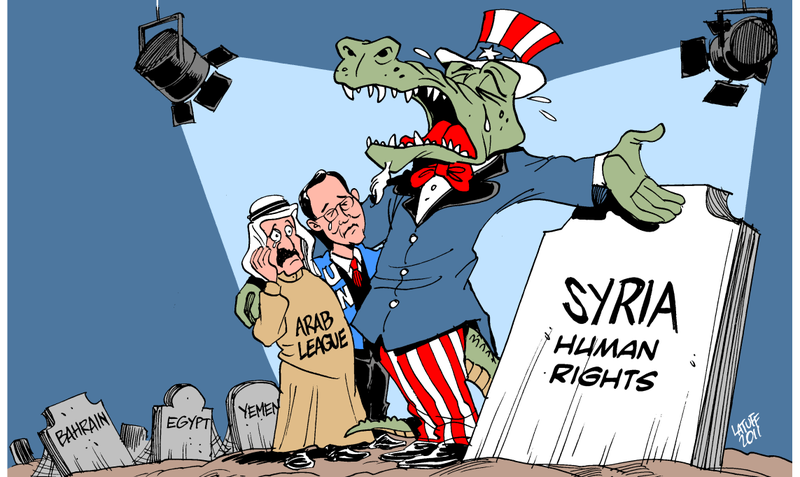 Why are we killing Syrian military in Syria! We were never ask to assist Syrian troop or to kill Syrian troops. I think my dear country , America, is behind this. We apparently was another country overthrown! War is a racket of the rich and fought and paid for by the poor and middle class There is only one way to stop them, a full out tax revolt. Tough to do when good paying jobs are so far and few between.